a machine for the production of bent sections of strip metal, each with a complex cross section, through a process of cold forming, or bending, between rolls. Cambering machines are used mainly for producing lightweight sections, and the process is more efficient than either rolling or extrusion. Any sheet metal with sufficient ductility, such as steel or nonferrous metals and nonferrous alloys, and with the proper thickness (from 0.1 to 19 mm), width (up to 2,000 mm), and length (up to 30 m), can be subjected to forming. The cambering machine is equipped to unroll, straighten, and cut the strip or sheet of metal prior to the forming process. There is also equipment for finishing and extracting the section after it has been bent. The gradual bending of the strip or sheet into the required section is accomplished in one operation as the strip or sheet passes through a series of rolls arranged in pairs, which can number as many as 30. The working rolls are composite in design, that is, made up of several disks (Figure 1); the particular section required is formed with the appropriate disks. 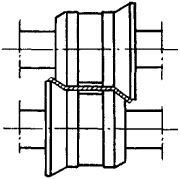 Vertical rollers, which hold the strip in position and effect the additional bending required for closed sections, are installed at the sides of the machine. The rolls are driven by an electric motor with a power of up to 150 kilowatts. The bending operation can be performed at speeds varying between 12 and 250 m/min. Bent sections are widely used in various branches of industry.